If you’re trying to set up a crew on your own to clean the windows of your apartment complex, church or school, think no further. The time and energy spent on cleaning products, men and time, you could have called us! Innovative Window Cleaning specializes in using the highest quality in products, cleaning team and service. We work with the highest standards to guarantee 100% customer satisfaction. Contact us today and we will have an estimator visit your facility to produce a price quote that we guarantee a low-cost window cleaning service! We have the scaffolding, ladders, squeegees, and our secret formula to get the cleanest windows in Chicago! Add to the beauty of spring with Innovative Window Cleaning. Your Best Value In The Chicago Area What makes Innovative Window Cleaning the best value and smart choice in the Chicago and suburban Illinois area? Our quality work and reputation! We clean windows for some of the largest buildings, event centers, and schools in the area. We are the go-to company for several commercial buildings across Northern Illinois, but don’t take our word for it, try us today and see for yourself! For many corporations and small business, we are the preferred choice for commercial window cleaning services in Chicago, Illinois. 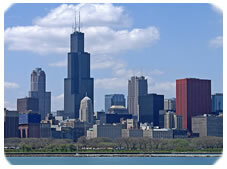 Attention Property Managers in Chicago, do you have a board meeting coming up? Window Cleaning Interrupting Your Work Day? If you own a business and count on your employees to be productive each day, you know how distracting it can be when maintenance, window cleaning, or even cleaning crews shuffle through during the day and thought out your building and premises. Though we can not help you in all those areas, we care about the professionalism with which we do our job at Innovative Window Cleaning. Our employees have been trained to respect your workplace and employees and understand all of the safety guidelines and stringent regulations. Our long-term goal is to make a beautiful space for your team to work in, inside and out, without being noticed at all. In fact, if you speak to us ahead of time about your window cleaning needs, we can even plan specific hours in which we can do our job with his little distraction as possible. In today’s business, every little bit of productivity helps. If we can save your team a combined several hours of focus, we consider it a job well done! If you need crystal clear windows, pick up the phone and call us today. We clean architectural glass used for structural, lighting, or decorative purposes. Exterior window cleaning is the process of cleaning a building’s exterior windows, including the restoration of good hygiene or removal of litter or dirt. Not to be confused with interior cleaning, exterior cleaning draws on aspects of environmental care, architecture preservation, and psychological well-being, in addition to traditional cleaning. Innovative Window Cleaning seeks to provide innovative and cost effective window cleaning solutions for your high rise and commercial window cleaning needs. Our window cleaning services cover a wide variety of areas. All employees and crew members abide by OSHA laws. Building types: Skyscrapers High Rise Low Rise Commercial Retail Retirement Homes Hotels Office Stadiums Race Tracks Municipal Buildings Services Include: Interior and Exterior Post Construction Stain Removal Aerial Lift Boom Scaffold and Stage Work Caulking Our highly trained and experienced personnel are conditioned to service all of our customers with honesty and integrity in a safe, efficient systemized approach. Customer service is our number one priority! Call 888-535-1440 for a free estimate or click here to fill out our window cleaning contact form. Why do high-rise office windows need to be cleaned? No one enjoys wearing glasses that are dirty because they are unable to see clearly. The same is true for windows in office buildings. A dirty office window makes it difficult for employees to work effectively. Each time employees glance through the window, they focus on the dirt and grime, not the scene outdoors. Studies show that every fifteen minutes office workers need to take their eyes away from their computer screens and focus on a distant object to avoid work-related injuries. A dirty office window hampers this effort. Cleaner windows also result in better energy efficiency and lower overhead costs. A clean window allows in more natural light. Quite simply, employees use less electricity when they can see properly. Luckily, Innovative Window Cleaning offers fast, cost-effective window cleaning for a variety of different office window configurations in all types of high-rise buildings. Our employees are trained to clean your corporation windows in the safest way possible to perfection, being careful to follow all local building safety code requirements. When they arrive, our window cleaners will inspect the building site, confirm the price, and advise you exactly how they plan to execute the job, and answer any questions you might have to ensure your complete satisfaction. Please contact us for a free estimate.